The House of Representatives might be embroiled in another drama over accusations its members took $30,000 as bribe to back down from overriding President Buhari's veto. Members on Wednesday denied an allegation that they received $30,000 bribe to back down from overriding President Muhammadu Buhari’s veto on the Electoral Act (amendment) Bill, 2018. 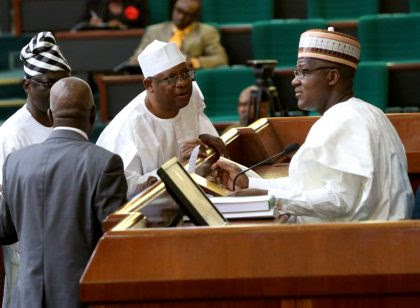 According to Punch, the reps described the allegation as “pure falsehood”intended to intimidate lawmakers to abandon their insistence of changing the sequence of elections ahead of the 2019 polls. The issue was raised by a member of the house at plenary with Speaker, Mr. Yakubu Dogara referring the issue to the Committee on Ethics/Privileges for investigation. Buhari had rejected the controversial amendment, which sought to change the order of elections by placing the presidential poll last. He withheld his assent to the bill. But, the House in particular, began a process of passing the bill again for Buhari’s signature. However, before the referral, lawmakers took turns to express their anger over the allegation and threatened to initiate legal actions against the media houses that published the allegation. Danburam-Nuhu said following the allegation, his constituency had begun to question his integrity, allegedly accusing him of taking bribe. He added, “I earned my reputation through hard work and I will not sit here and allow people to say things that are not true. He spoke further, “We know the truth. The truth is that there is no such transaction in this House. An All Progressives Congress member from Kano State, Mr. Aliyu Madaki, challenged anyone making such an allegation to produce the evidence. “It is wrong to assume that everybody is corrupt and everyone accepts bribe. A member from Abia State, Mr. Uzoma Nkem-Abonta, asked whose interest the lawmakers would be serving by reversing a bill they had long passed. But, the Leader of the House, Mr. Femi Gbajabiamila, said a preferred line of action was to sue the media organisations that published the alleged bribery. Gbajabiamila argued that suing the media houses and their reporters was the only way to stop what he called “incessant attacks” on the National Assembly. He added, “This is a matter for litigation. It is the only way to stop the incessant attacks on the National Assembly. “Bribery and corruption are criminal offences punishable by a term of imprisonment. The only defence in this matter is truth and proof. However, Dogara directed that the matter should first be investigated by the Committee on Ethics/Privileges to guide the House on what course of action to take in a law court. “It is a matter of privilege. By our rules, matters of privilege are investigated by the Committee on Ethics and Privileges,” the Speaker said.